Did you know that there are two Eclipses in January? There was a partial Solar Eclipse on January 5/6th and there will be a full Lunar Eclipse on the 21st. The Solar Eclipse signifies that many possibilities are available and we can start afresh, cleansing old behaviour patterns in order that we are able to make progress. The Full Lunar Eclipse is made more potent by the Red Moon and provides us the opportunity to clear the patterns of the past. Today we are at the midpoint between these two significant events. 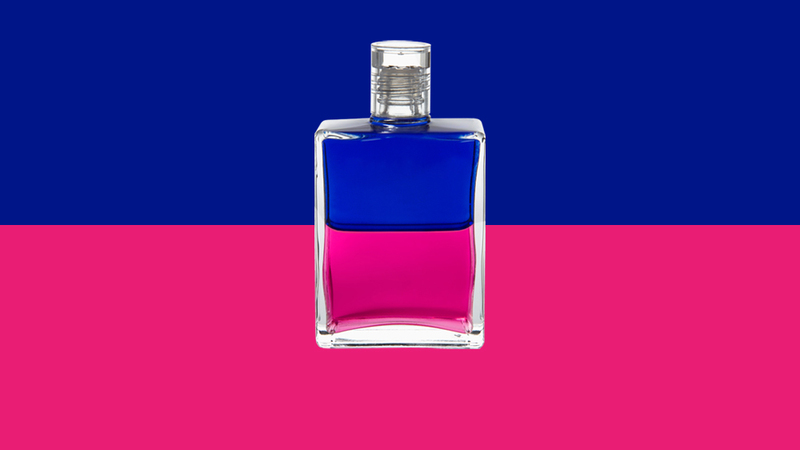 This time between two eclipses is a very poignant for the arrival of the latest Equilibrium bottle, Queen Mab B116 – Royal Blue and Magenta. The Royal Blue invites us to see ourselves more clearly, and rather than focusing on the external projections of ourselves, it supports us to look within. The Magenta shows us how important it is that we put our caring, our warmth, our love in to the little things, how it is that we begin to manifest that compassion towards ourselves and how it is that we might find the way to overcome our differences. B116 is about trusting our intuition as we look within and love the different aspects of ourselves. Opening up possibilities and a deep harmony within ourselves, with others and the environment around us. These vibrant and powerful colours allow us to enter the consciousness of humanity through our connection with nature.